Seven-year-old Chula and her older sister Cassandra enjoy carefree lives thanks to their gated community in Bogotá, but the threat of kidnappings, car bombs, and assassinations hover just outside the neighborhood walls, where the godlike drug lord Pablo Escobar continues to elude authorities and capture the attention of the nation. Inspired by the author's own life, and told through the alternating perspectives of the willful Chula and the achingly hopeful Petrona, Fruit of the Drunken Tree contrasts two very different, but inextricably linked coming-of-age stories. In lush prose, Rojas Contreras has written a powerful testament to the impossible choices women are often forced to make in the face of violence and the unexpected connections that can blossom out of desperation. Ingrid Rojas Contreras was born and raised in Bogotá, Colombia. Her essays and short stories have appeared in the Los Angeles Review of Books, Electric Literature, Guernica, and Huffington Post, among others. She has received fellowships and awards from The Missouri Review, Bread Loaf Writer's Conference, VONA, Hedgebrook, The Camargo Foundation, Djerassi Resident Artists Program, and the National Association of Latino Arts and Cultures. She is the book columnist for KQED Arts, the Bay Area's NPR affiliate. “One of the most dazzling and devastating novels I’ve read in a long time…An exquisitely intimate double portrait of two young women....Unforgettable...Readers of Fruit of the Drunken Tree will surely be transformed." "Original, politically daring, and passionately written--Fruit of the Drunken Tree is the coming-of-age female empowerment story we need in 2018." "A coming of age story, an immigrant story, a thrilling mystery novel, thoroughly lived and felt—this is an exciting debut novel that showcases a writer already in full command of her powers. Make room on your shelves for a writer whose impressive debut promises many more." 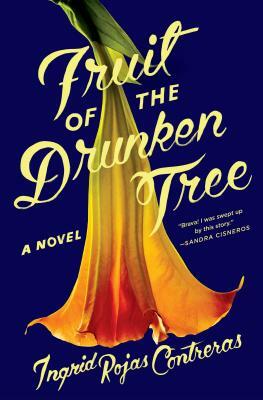 "Set against the backdrop of Pablo Escobar's stranglehold on the fate of a nation, Fruit of the Drunken Tree is a spellbinding story of two girls whose realities collide and who are forced to make nearly unbearable choices in the name of survival. The thrum of mystery and danger haunts every page, and you won't be able to look away until you turn the last one." "From its unforgettable opening image to its heartbreakingly perfect final line, Fruit of the Drunken Tree casts an irresistible spell, summoning us into the fierce, perilous world of two young girls in a nation on the brink. Ingrid Rojas Contreras’s lush language finds hidden beauty in even the ugliest pain. A stunning debut." "This is storytelling as a heroic act, and Ingrid Rojas Contreras is a heroine that literature desperately needs—her every page feels born, urgent, and blazingly true."